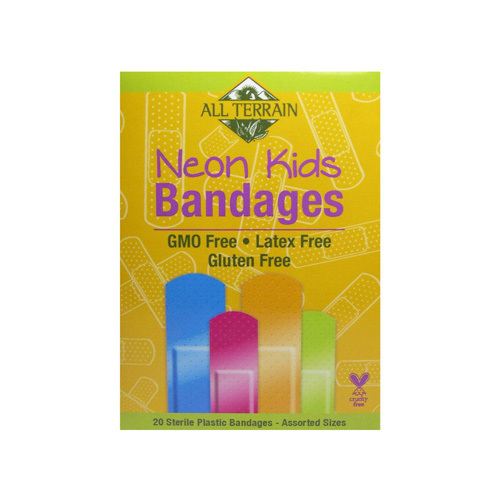 All Terrain Neon Kids Bandages in assorted sizes for everyday kids� first aid needs, naturally. The GMO free bandages are latex and gluten free and 100% sterile. For use on minor cuts, scrapes and burns. Long-lasting, sure-stick adhesive stays secure to kids on the go. Contains 20 neon color bandages in assorted sizes. Flexible and durable protection for kids sensitive skin. Ingredients: GMO, latex and gluten free.